Each and every day, members of our military sacrifice time with their loved ones in order to keep our country safe. Being apart at the holidays is routine for many military families. To show appreciation for all that they do, Mazda North American Operations (MNAO) and their employees are giving back in December to those who have given so much to our country, through the Mazda Drive for Good® program. It’s not just about the money, but more about the time spent by employees, and the personal connections that are made with these families that truly hits the heart of what the Mazda Drive for Good program stands for. Earlier this month, Purple Heart Veteran and U.S. Marine Corporal Robert Hamilton III, was officially welcomed home in Eudora, Kansas. Robert and his family were awarded keys to a mortgage-free home from Operation Homefront and JPMorgan Chase & Co. The house was provided to them just before the holidays, through Operation Homefront’s Homes on the Homefront program. To congratulate the family on their accomplishments, and to welcome them home, Mazda decided to offer them another surprise… a new Mazda CX-5. The vehicle was gifted to the Hamilton family free of charge; all expenses, including tax, title, and registration were covered by Mazda and JP Morgan Chase & Co. In addition, their local dealership, Premier Mazda, pledged to support the vehicle with complimentary maintenance for the next two years. In September, during Mazda’s annual Military Appreciation Weekend at Mazda Raceway Laguna Seca, Mazda also honored two military families for their selfless service to their country by awarding them with a Mazda vehicle of their choice – all expenses paid. Just in time for the holidays, Mazda delivered the customer-ordered Mazda CX-9s to both veterans at their closest dealership, John Hine Mazda. In addition to providing transportation to three deserving military families, Mazda spent the morning prior to delivering the vehicles volunteering with Operation Homefront in San Diego, California. During the volunteer event, Mazda employees, San Diego Miata Club members and local media prepared toys and food to be given to military families ahead of the holidays. “While the money we give back is important, what’s even more important is the time that we spend working in the community that truly makes a difference,” said Moro. 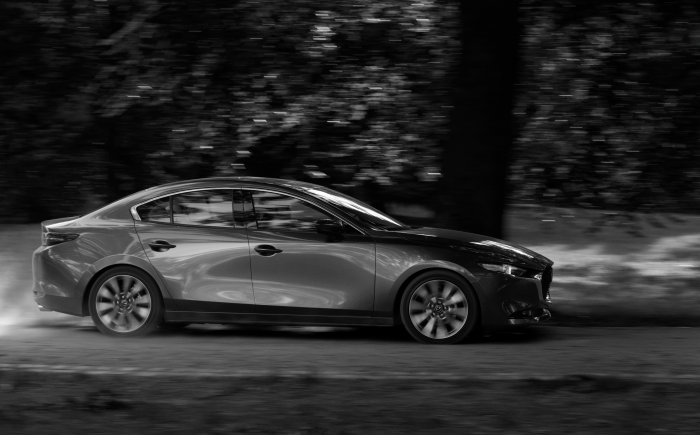 Since its launch in 2013, the Mazda Drive for Good program has donated more than $23.4 million, pledged more than 313,000 charitable service hours and continues to provide monetary donations and community service throughout the year.